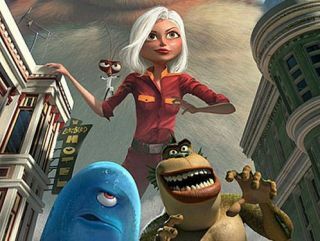 Monsters Vs Aliens was outed as the world's first 3D Blu-ray disc at CES 2010 and now it has an official European release date. The 3D Blu-ray is only available when you purchase a new Samsung TV or Blu-ray player and will have a UK release date of March 2010. At Samsung's European press conference in Vienna, with TechRadar in attendance, the company announced that it is going head-first into 3D, being the first to market a 3D ecosystem which includes its U7000 televisions and its 3D blu-ray player, the BD-C6900. "3D is not a niche or novelty product for Samsung, that is why we have 20 3D TVs at launch and why we are first to market," said Samsung's Michael Zoller about Samsung's 3D plans. Some were predicting/hoping that Avatar would be the first 3D Blu-ray, aping its success at the cinema for the home market. Samsung's U7000, U8000 and U9000 series of 3D TVs use active-shutter technology. Samsung is also offering 3D in plasma form, with its PDP7000 range.